As a child, my grandmother taught me to knit. I'm probably not the worlds best knitter but I am quite competent and I love the peace and relaxation that knitting affords me. 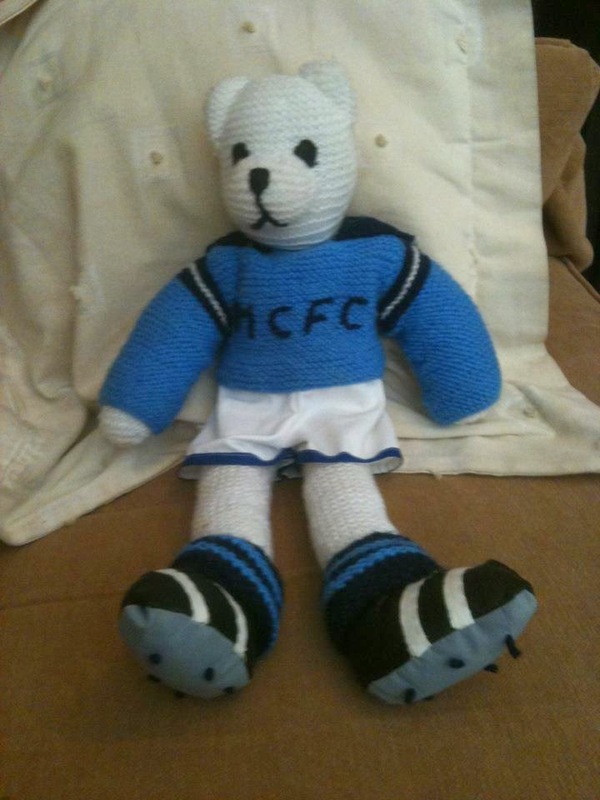 This little guy is City Bear and is a treasured possession of my son, knitted for him by my grandma. My grandmother was also an excellent sewing machinist. Having worked for many years as a seamstress, the task often fell to her when we needed repairs and alterations doing. This talent for precision and patience, with a needle and thread, never made it to the next generation or to the one after that. When it came to sewing classes at school I was beyond anything my teacher had seen before. When my friends made 2 or 3 garments a year, I failed to complete one plain blue cotton t-shirt in the same time. Sewing, simply isn't something that I have a talent for. Sewing is something that I have always wished that I were able to do. This is because I rarely find clothes that I like in the shops. I have many many clothes that no longer fit me or no longer suit me and I longed to be able to do something with them. After all I have lots of material that I love and it would to superb to make things that I actually like and that actually fit me properly from it. Last summer I treated myself to a lovely pink sewing machine and started to learn to sew. As I wanted something quite specific I carried it across the globe in my suitcase. This effort ensured that I will continue to use it and not give up! I am never going to be an expert. It just not something that I am naturally good at. I am going to keep trying though. I don't ever want to make clothes from patterns because even the thought of doing this bores me silly. I hope to up-cycle as many of my clothes as possible though rather than just throwing them out. In this world where so many things have become disposable, it is a good feeling to re-purpose and re-fashion things. 'Make Do and Mend' - I hope my grandma would have been proud!